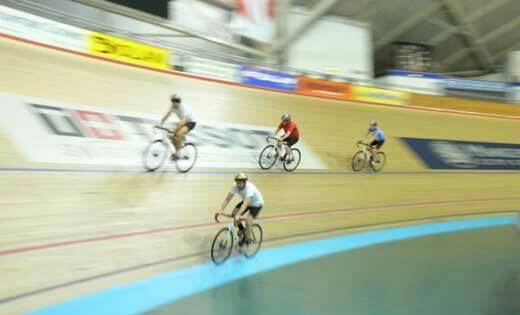 Recently, I was lucky to get a chance to cycle around the track at the Manchester Velodrome. While I have seen a few races on tv, it was the first time I have been inside the National Cycling Centre in East Manchester. In fact to be honest, it was the first time I was ever in a velodrome. With a trusty fixed gear bike rented from the center, cycling around the track was a truly exhilarating experience. That said, it did take a bit of getting used to and was somewhat disconcerting at the beginning to do a lap of the track without the need for turning the handlebars! 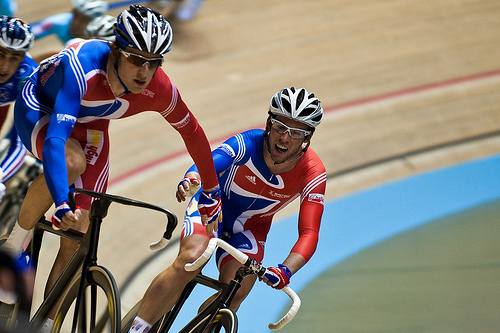 Mark Cavendish, the local hero on his way to becoming Madison World Champions in 2008. Before taking the track, we were treated to watching a madison race where team riders slingshot each other around the track on alternate laps. 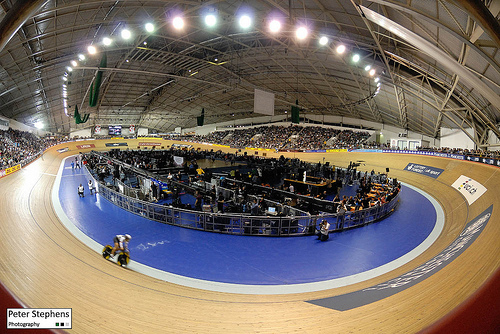 The wooden track is independent of the structure of the building allowing it to move with the ebb and flow of the cyclists during a race or time trial. The building itself it not the most pleasant environment with a distinct lack of natural ventilation and lighting which is a real shame considering how easily the vast roofed space could have been lit and ventilated. The ancillary accommodation is equally uncomfortable with dark corridors leading to stuffy changing rooms and showers without any windows whatsoever. The presence of the velodrome since the 2002 Commonwealth Games has hugely boosted the cycling culture in the city and it is not unusual to see fancy customized fixed gear bicycles inside and outside many of the hipster coffee shops and clothing stores in the northern quater of the city. The strong culture has also to do with the success of I Bike MCR, a fantastic grassroots cycling community based in Manchester that regularly organises Critical Mass in the city alongside other community initiatives.